The Acrobat® Display Options control settings used by Acrobat Reader when displaying PDF files. Note: the Page Transition Effect settings currently don’t work with Acrobat Reader for Mac OS X. They do work in full-screen mode for Acrobat Reader for Mac OS 9. 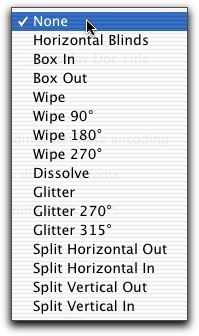 Use differential font encodings not base encoding: This causes PStill to emit full font encoding vectors rather than using a reference base encoding vector. This is necessary for some PDF post-processing software, in particular, the software used by the NSF FastLane site.